Exotic Travels & Adventures is a non-profit travel club whose aim is to bring together people with a passion for travel, by organising regular exotic tours (to India, Sri Lanka and Kenya to name a few). By organising group tours, members can realise the benefits of sharing their experiences with others as well as the benefits of group travel discounts. 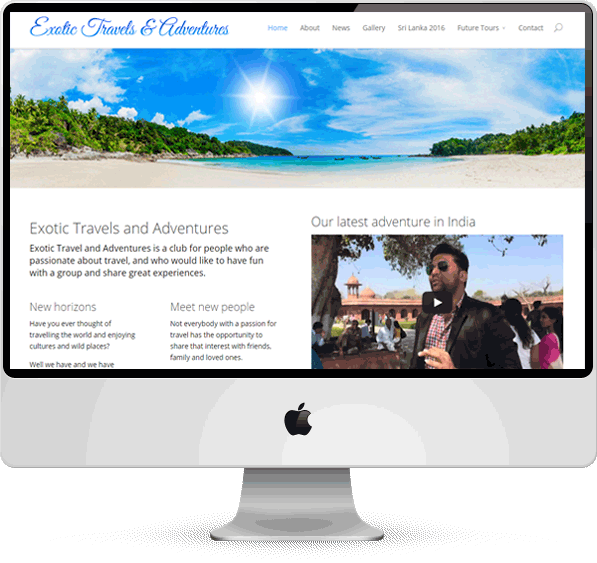 The Exotic Travels website is an example of our BlackboxFlex web package. It incorporates image galleries, social media integration, a ‘news’ blog that can be updated directly by the client (as well as allowing moderated comments from visitors), as well as embedded videos and dynamic maps. You can see the live Exotic Travels & Adventures site here.